The first trailer for Star Wars: The Force Awakens is about to be released. Those of you fearing that you will have to go to a movie theatre to see it will be relieved to hear that it will also be released online. 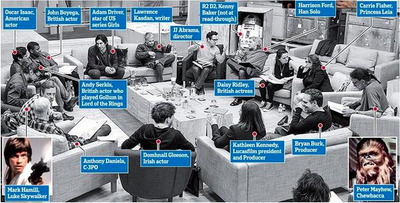 In the meantime, from TV Secrets (follow here), here’s a fun picture of some of the cast during a script read-through. Note the cameo by R2D2 in the upper right. The actor who plays him was apparently unavailable.